A tropical oasis packing a strong dose of heavenly splendor, Honolulu is situated in the southeast corner of Oahu, in the Hawaiian Islands. Originally settled by Polynesians who arrived in canoes, Hawaii has become a melting pot of all nationalities and religions, making for a diverse paradise with distinct Asian flair. Kawaiaha’o Church, coined “Hawaii’s Westminster Abbey,” is a house of worship built from coral blocks quarried from reefs offshore. Its interior is lined with intricate woodwork created from the forests of the Koolau Mountians. 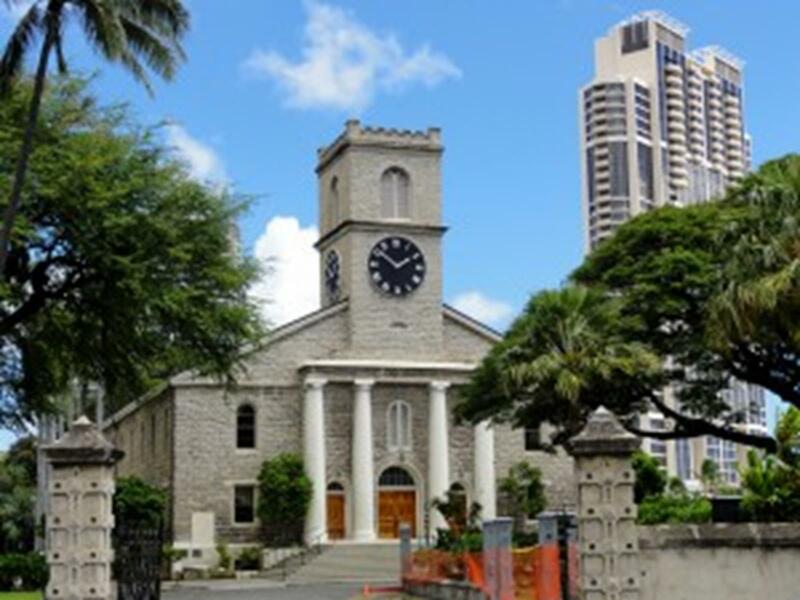 The venue for coronations, weddings, and funerals of generations of Hawaiian royalty, this church houses an upper gallery with paintings of the royal families. English and Hawaiian Christian services are held each Sunday, and church members are exceptionally welcoming, greeting visitors with leis. The oldest Buddhist temple in the Islands, Kuan Yin Temple carries a symbolic name. Kuan Yin is known as a bodhisattva—one who chose to remain on earth to do good even after achieving enlightenment. All over the island you see representations of Kuan Yin holding a lotus flower, symbolizing beauty in the form of the flower which grows from the mud of human frailty. At the temple she can be seen pouring out a pitcher of oil (like mercy flowing) or as a sort of Madonna with a child. Respectful visitors are welcome. Located in downtown Honolulu, Izumo Taishakyo Mission Shrine transports you to historic Japan. One of few Shinto shrines in the United States, the A-frame architecture was inspired by a classical Japanese shrine. Guests are welcomed with incense and walls of beautiful Asian art. The shrine is best known for its “Hatusmoude,” or New Years blessing, when thousands of believers and friends come forward to begin the year by purifying their body and soul. 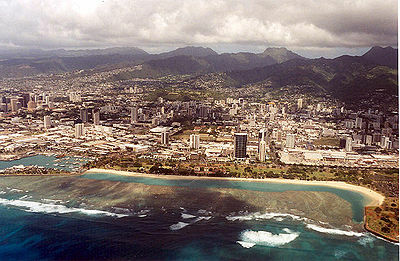 Oahu, the third largest of the Hawaiian Islands, is small enough to tour and ideal for day trips as well. The Polynesian Cultural Center, located in Laie, just an hour’s drive north of Honolulu, offers groups a memorable experience. The center has several affordable packages that include a tour guide, a traditional luau dinner and cultural show depicting the rich history of Polynesia. A culturally diverse staff represents many Pacific Ocean countries, from Samoa to Tahiti. 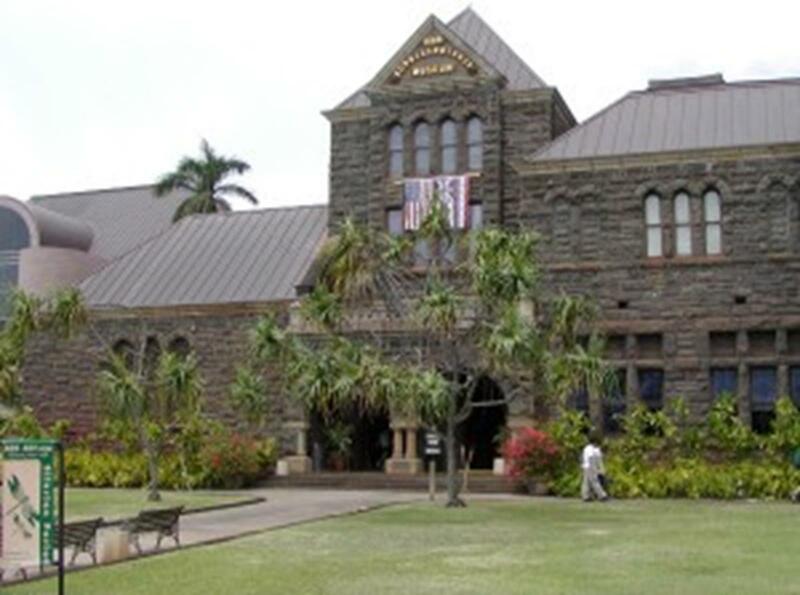 Learn about ancient Hawaiian gods and goddesses at the Bishop Museum, which houses an extensive collection of Hawaiian artifacts and royal family heirlooms. The museum has millions of artifacts, documents and photographs about Hawaii and other Pacific island cultures. The three floors of Hawaiian Hall take visitors on a journey through the different realms of Hawaii’s mystic origins. The museum offers special group rates and has educational programs available. Just 15 miles from Honolulu is Byodo-In Temple, no longer an active temple but a striking structure with a rich history. This replica of an ancient Japanese temple was built entirely without nails. The temple grounds are a lushly landscaped paradise and home to wild peacocks and hundreds of Japanese koi carp. Amida, a golden Buddha, thought to be the largest wooden figure carved outside of Japan, sits towering more than nine feet high. This Hawaii State Landmark has an original Japanese tea house that is now the temple’s gift shop. Groups are welcome and tour guides are available. If sightseeing has your bunch worn out, the coastline offers sandy white beaches just asking for group travelers to slow down and relax. Easily accessible Ala Moana Beach, minutes from downtown and Waikiki Beach, is gently sloping and ideal for swimming and water play. Often less crowded than other resort locations, this beach has calm, clear waters and ideal sunset-gazing opportunities. The close proximity of the Hawaiian Islands makes hopping from one to the other easy. Many day tours by air allow groups to sample some of Hawaii’s most precious spots. In January, Honolulu’s Chinatown celebrates the . Month-long festivities follow the Chinese lunar calendar, and the Chinatown Cultural Plaza hosts a four-day event, serving up a variety of Chinese and other Asian cuisine favorites. Unique to Hawaii is the art of hula dancing. Honolulu holds the World Invitational Hula Festival in early to mid-November. Every attraction and event carries a meaningful story, connecting it to the past. Hawaii is steeped in tradition and welcomes visiting groups, making them feel at home and a part of the Islands’ rich legacy. Hawaii’s spiritual roots run deep. Ancient Hawaiians believed that everything in the universe has their own spirit. From Ancient Heiaus (Hawaiian temples) to our breathtaking 19th century coral churches and Buddhist temples, Oahu’s ethnically diverse population has created a harmonious melting pot of cultures, traditions and beliefs. No matter what one’s religion may be, there is a welcoming spirit of aloha that flows throughout the island, making it an ideal destination for people of all faiths. – Noelani Schilling-Wheeler with the Oahu Visitors Bureau. Charleston was founded in 1794 and contains religious treasures such as St. John’s Episcopal Church, which was used by the Union Army during the Civil War. Besides its religious attractions, Charleston’s geography accommodates attractions like the Criel Mound and Treetop Canopy tours. Saint Nicholas of Flüe is the patron saint of Switzerland. Nicholas, born in 1417 in Unterwalden, was a distinguished army officer whose heroics helped keep the rebellious canton of Zurich within the Swiss Confederation. He settled in the alpine foothills of Flüe on Lake Sarnen, married and had 10 children. His family farmed there and he became a local judge for several years and even turned down the chance to become governor. Pittsburgh is known for its historic sites and unique sightseeing adventures like the Monongahela Incline and Duquesne Incline rides to the top of Mt. Washington for skyline views. Pittsburgh is also home to St. Anthony’s Chapel, which claims to have the largest public collection of holy relics in the world.